I didn't watch any of the Royal Wedding, but I did check out the photos of the guests afterwards. I love how so many of the women wore hats. I wish we still wore hats. Princess Beatrice and Eugenie (daughters of Fergie, Duchess of York) got some major attention with their over-the-top hats. 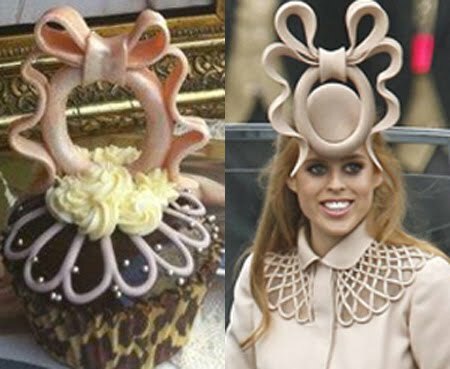 According to Glittarazzi.com, Princess Beatrice's hat was so weird-shaped that Wir Machen Cupcakes, a bakery in Munich, has designed a cupcake inspired by the hat. 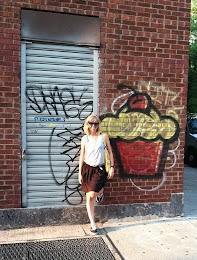 Even as a cupcake it looks strange.